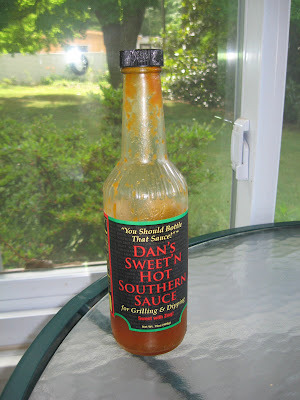 I bought a bottle of Dan's Sweet n' Hot Southern Sauce at the Cleveland Spring Festival. The elementary school was selling bbq sauce to raise funds for extra projects which is sure better than wrapping paper and knickknacks they sell. I vote for barbecue sauce, and Dan's is a really good one. Actually, Dan bills his mixtures as general sauces, and they are more versatile than most North Carolina barbecue sauces which are generally designed to be mopped on pork or chicken. 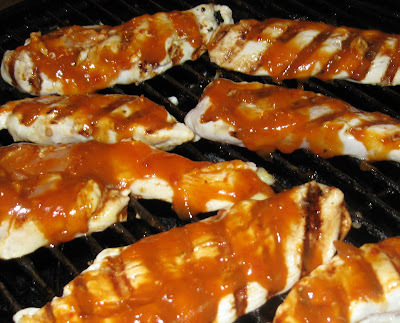 But, you can certainly use Dan's as you would your favorite barbeque sauce plus also for general dipping or as a base for stir fry with a Southern twang. Dan's sauces are tomato based, but there's some vinegar in there and spices. You can taste the Carolina influence, but his sauces are different than others from the area. I got the Sweet 'n Hot Southern Sauce, since I love spicy foods. I tried a little taste sample first to be sure it wouldn't be too hot for my son who is not a big "hot" fan. The sauce comes on pleasantly sweet with a nice back kick. There's some heat, but the sauce would not be too hot for most folks. We used Dan's BBQ Sauce on some chicken last night. As you can see, we grilled the chicken close to done (below) and then lathered on some Dan's. With the tomato base, it needs to go on close the end of the grilling time as do other sauces that are thicker and with sugar. Yum. That was some good chicken. Dan's Southern Sauce was a great contrast to the chicken and added some punch with the hot version. Sharon Phillips, as in Mrs. Dan, of Dan's Southern Sauce sent a really nice email. She said they are small and sell local at both Fresh Market stores in Greensboro, at "The Extra Ingredient" also in Greensboro, as well as the Greensboro Farmer's Market. You can also find Dan's Sauce at the Winston Salem Fresh Market and "A Southern Season" in Chapel Hill. If you can't road trip it to NC, then head back to the web site. That's one thing I love about the Internet, I can get small, local sauces that are full of flavor and history. I look for those when I travel, but I can't hit every state and find every sauce. Can't do that online either - but it does expand my sauce habit.